time surfing the net for news. want directly to your desktop! from 3D Internet Group now! Unlimited Choices - Choose from a frequently updated list of the most popular news sources on the web or if we left off your favorite news source, NewsDart has the UNIQUE ability to search your own custom news sources! No more TICKERS! - NewsDart has been finely tuned to perform quietly in the background. It scans your selected news sites for your personal keywords as often as you'd like and delivers the headlines to your desktop - just click on a headline and NewsDart lets your browser do the rest. Save Time - You spend enough time digging through the web's tangled . 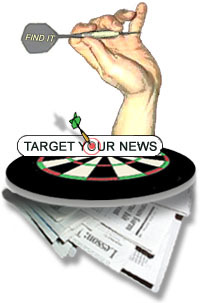 . . web, there is no need to spend your valuable time scanning news sites when NewsDart can do it for you! General Headlines - breaking national news, tech news, business news, etc. Stock News - breaking news on companies affecting people's stock portfolio. Hobbies - news regarding a particular subject of interest - astronomy, pottery, quilting, etc. Research - news for people whose jobs rely on keeping up with breaking news in their industry. Auctions - new items posted to auctions that you visit frequently, but don't have time to keep an eagle eye between multiple auction sites.